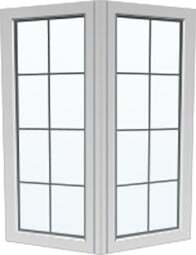 This exclusive design, only offered by Meloche Windows, gives the homeowner a unique perspective in style and diversity. The Point of View window is a two-lite bay which offers you the choice of a birch or an oak head and seat. Projects outwards from home allowing the beauty of nature to filter in. Available in 30 and 45-degree radius. This window provides a head and seat feature in which to relax and enjoy the view. Fusion-welded frame corners and sash corners. Birch hardwood accommodates paint finish. Oak hardwood accommodates stain finish. Installed in your home with steel reinforcements. Staining or painting available for trim, head, seat, and casings.